Girls really do just want to have fun! And fun is what went down at the first Tag Carnival for Girls held at Evergreen Secondary. 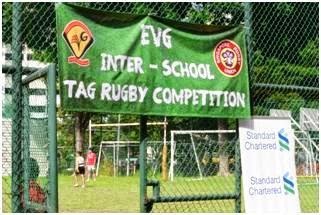 An initiative to get more females involved with Rugby, Evergreen Secondary and Singapore Rugby worked together to organise a successful tag tournament. 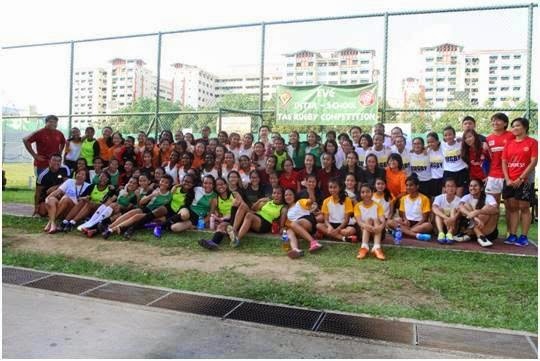 For the first ever Girls Only Carnival, we had 5 schools participate in the U14 (5 teams) and U17 (6 teams) categories. Leading up to this event our Standard Chartered Rugby Development Officers went out to each school to perform free training sessions to prep teams on the rules. Our very own National Womens Players Mei Giet and Lee Yi Tian helped the Standard Chartered Rugby Development officers to officiate the matches. All teams show tremendous ball handling skills and incredible speed. The staff were really impressed by the talent and were excited about the future of Womens Rugby in Singapore. With a total of 84 girls involved, we hope to increase this number and continue to develop and create more competition at the Secondary level. Watch this space! Congratulations to Evergreen Secondary (Red) winners of the Under 14 category, also Bukit Batok Secondary for taking out the Under 17 category. Lastly, we would like to thank all the teams, teachers and coaches who participated in this carnival. SRU would also like to acknowledge Mr Adam Chan and the Evergreen Boys B & C Division players for their contribution in the success of this carnival. We look forward to more competitions ahead!